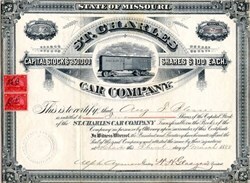 Beautiful certificate from the St. Charles Car Company issued in 1888. This historic document was printed by Buxton and Skinner, St. Louis, Mo. and has an ornate border around it with a vignette of a boxcar in oval surrounded by title. This item has the signatures of the Company’s President, W. H. Glasgow and Secretary, Alph Aymond and is over 126 years old. Trimmed in XF condition. 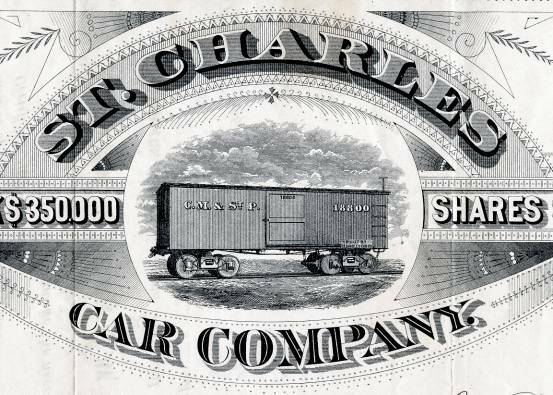 St. Charles Car Company, a railroad rolling stock manufacturing company located in St. Charles, Missouri, was founded in 1872 or 1873. In 1899 it merged with twelve other companies to form American Car and Foundry (ACF). The St. Charles plant became the main passenger car works. With a failing market for steel passenger cars, ACF phased out the St. Charles operation in 1959.